This App Puts An End To The Woes Of "Rishta Hunt"
Rishta search in Pakistan is one of the most ignored part of our system. First of all it’s difficult to find the right match, rest our society has gathered so many unwanted issues which is adding to the difficulty. A mother of 3 daughters, aged 32, 28 and 25, all unmarried, says she has given PKR 10,000 to a Rishta aunty but even after 6 months she didn’t get a single match for her daughters. All daughters are graduated from reputable universities, but the families referred to her were either lowly educated or their family background did not match theirs. A girl from Lahore says that 5 families have come to their house to see her as viable Rishta but no one responded back. She says her color is wheatish and every body demands that the girl should have fair color. Now she has told her mother that all prospective rishta seeking families can just see her photo but she will never come in front of them serving tea. A boy from Karachi told his parents that he liked a girl from his university and wanted his parents to talk to her parents for Rishta, but the father refused since the cast of the girl’s family did not match theirs. A family is known in the town for having visited some 30 homes to find the perfect girl for their only son who is well settled with a high salary. Those whom they visit, never get to hear back from the family, save that they are looking ‘other options’ as well and will let them know soon. A girl finally got engaged in Multan. Just 2 weeks before the wedding the bride-to-be’s mother was told to arrange a car, gold jewelry, furniture, etc. so that her daughter could live comfortably in the new family. 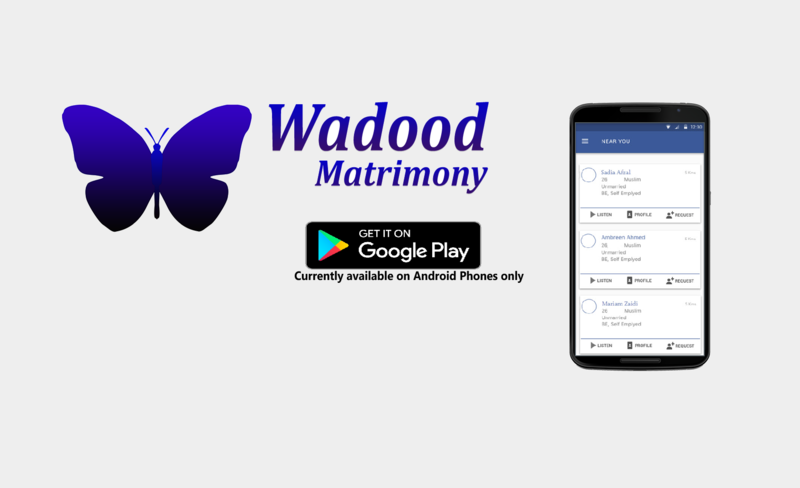 Recently a company called Wadood Matrimony was launched. The company claims that they have designed a mobile App to solve most if not all, Rishta search problems in Pakistan. We talked to the founder of the company, Mr. Ali Nasir Hussain, a social worker and asked him how is this App making a change in Pakistani society with dense rooted problems. He said that majority of people ask for two things while searching for Rishta i.e. the girl should be fair and boy should have high income. But success of married relationship does not depend on these two things, instead happy married life depends on personality match between the couple. He said that sole focus of the App is to divert the attention of people from physical appearance and wealth towards personality of the individuals. For this to happen, they ask personality questions from candidates and their parents. Other people can listen to the answers and decide if their thinking, life style and personality matches with the prospective matches. Mr Ali said that the App is designed so that we stick to our values. Its not upto the boy and girl only to chat and then decide on their own. Instead if they think their personality matches with any one then their parents can contact with each other for further discussion and meeting with each other. The call center verifies earlier if the contacts given for parents are correct. Mr Ali said that a research was conducted to know drawbacks of Rishta search in the Internet. He said that first thing was fake profiles. In Pakistan there are hundreds of websites and facebook which provide online Rishta service but 90% of the profiles are fake. You don’t even know if the picture, name or even the gender is correct or not. To solve this issue the App takes only face photo and ID card number from CNIC and not the full photo of CNIC to protect the safety of CNIC. the details are then verified from NADRA. Only then the profile is published. Mr Ali said that the App is designed to curb against social problems in our society like discouraging Jahaiz. Some people visit 10’s of homes to find Rishta but still never feel satisfied. The App monitors the number of contacts one has visited. They have developed a feedback system as well. After meeting with the family, the App asks feedback from candidates about the other party. Then they can report any such activity or demands and these feedback will be added to the candidates’ profile. Of course nobody wants negative comments on their profile. The design of Wadood Matrimony looks promising. Response from public is huge and many people have registered their profiles. We hope that it solves the problems in Pakistan related to Rishta search. We hope that other people can also come forward and with the help of technology, solve other problems in Pakistan as well.